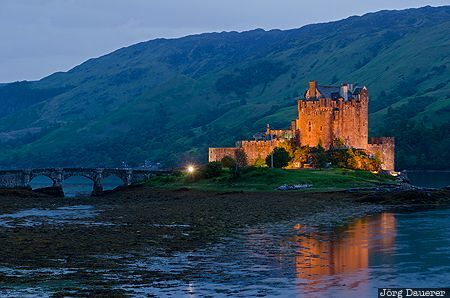 The flood-lit iconic Eilean Donan Castle and its reflexions in Loch Duich at the blue hour just after sunset in front of the green hills of the Highlands. Loch Duich is in Scotland, United Kingdom. This photo was taken in the evening of a cloudy day in June of 2013. This photo is part of the exhibition Blue Hour (October 2016). This photo was taken with a digital camera.